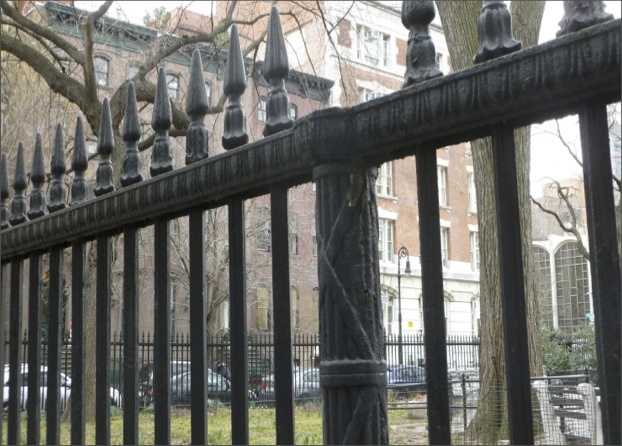 It was almost two and half years ago, in June of 2012 when the last $600,000 needed for the restoration of Stuyvesant Square Park’s historic, cast iron fence and the surrounding sidewalk was finally allocated after years of fundraising. The project, which had been pushed by the Stuyvesant Park Neighborhood Association, eventually had a total price tag of $5.5 million, funded by local elected officials. But today, work on the fence on the park’s east section, which needs some of its rotted pieces recreated, still hasn’t begun. A separate project to fix the park’s west section fence had been completed earlier. Work to accompany the fence project, such as fixing the damaged bluestone sidewalk, has also still not been done. Yet another long awaited and related project, to install a curb cut or ramp at the park’s eastern gate to allow access to wheelchair users, has also still not happened. But fortunately for those whose who’ve been following the progress, or rather lack of it, change does finally appear to be on the horizon. Community Board 6’s Parks Committee has been assured by the Parks Department that work will begin soon. Or rather, that it already has. Mark Thompson, who heads Community Board 6’s Parks Committee, said he’s been told the official start date of the project was October 20. However, he was also warned that this wouldn’t mean shovels would hit the ground on that date although work would begin internally on the project. As for when the actual repairs will start, there still doesn’t seem to be a set date for that, and one local tree-planting and park activist, Michael Alcamo, has said he’ll believe it when he sees it. Alcamo, a Stuyvesant Town resident, had spearheaded a letter writing campaign in 2012 that was instrumental in securing the last of the funds for the project from then-Borough President Scott Stringer. Though he conceded some of the blame for the delay on getting started was finding artisans capable of repairing the landmarked fence, which apparently there aren’t too many of, he said he is now concerned the project is no longer even considered a priority by the city. Alcamo referred to the mayor’s recently announced initiative to focus on the needs of parks in outer boroughs, particularly in poorer areas. “Has the money been allocated to outer boroughs? That would be useful for the community to know,” said Alcamo. He added that the fence isn’t even his main concern, but the cracked sidewalk is since that could pose a danger to pedestrians, as is the lack of of a wheelchair ramp. Alcamo, who recently founded an organization called Friends of Stuyvesant Square Park, had hoped to speed up the curb cut installation by asking Community Board 6 to pass a resolution calling for the work to be done, but, he said, the board’s Parks Committee declined. As for why the committee didn’t want to take that step, Thompson told Town & Village he didn’t think a resolution would be necessary since the community board has already had assurances from the Parks Department that the project will begin soon, including the installation of a ramp. Thompson added that he did understand Alcamo’s concerns since early on the fundraising process, $500,000 of the project’s funds were reallocated to another Parks Department need. A rep for Parks echoed Thompson in saying the city is not redirecting the project’s cash elsewhere. “No funds have been reallocated from Manhattan to the other boroughs and all the funds allocated for this project are intact,” Philip Abramson, a Parks Department spokesperson told T&V. He didn’t respond to a question about why the first company didn’t qualify though he did say that at this time UA Construction is working with the Department of Transportation on getting a permit for a street closure so work can begin. 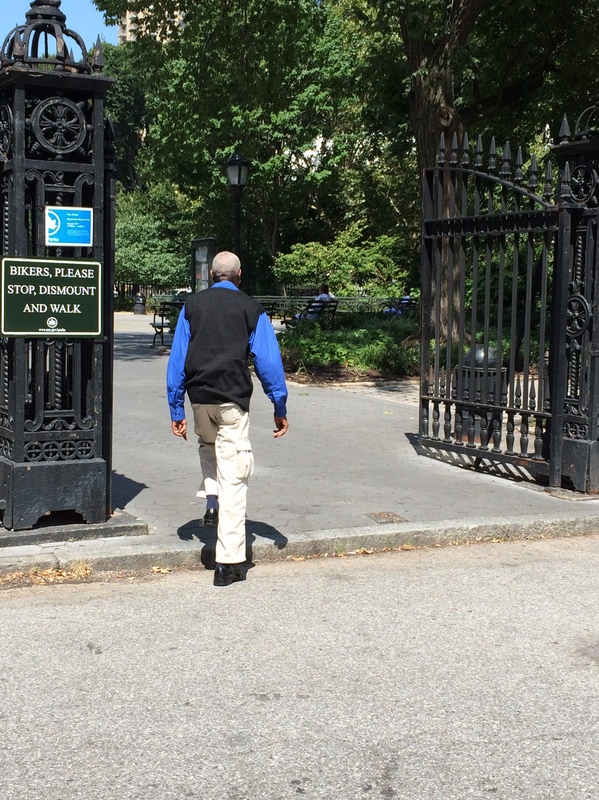 Rosalee Isaly, the president of the Stuyvesant Park Neighborhood Association, said she’s had a recent discussion with Parks reps to make sure the dog walkers who come to use the park’s dog run will be able to access it while work is ongoing. The labor-intensive act of planting should pay off in the spring though. Dozens of volunteers, mainly high school and college students, have been participating in monthly gardening days at the park to plant, paint benches and rake leaves. On a volunteer day in October, around 11,500 bulbs for tulips, daffodils and bluebells were planted. A DOT spokesperson did not respond to a request from T&V asking about the status of the permit and where the street closures would be exactly.